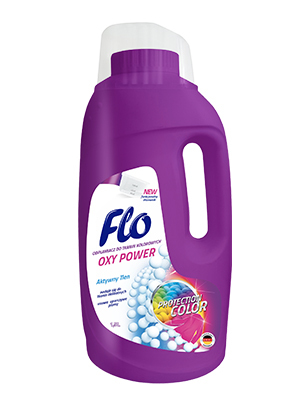 Flo Oxy Power Color is an innovative stain remover designed to remove stains from colored fabrics. Specially developed recipe makes the product extremely gentle to fabrics, and at the same time very effective. It does not contain chlorine. Thanks to the active oxygen content it perfectly removes stains without destroying clothes and it is also preserving their original colors. Flo Oxy Power Color stain remover contains active ingredients that remove stains, leaving the clothes perfectly clean. The product is suitable for removing various types of dirt, even those stubborn and very difficult to remove, such as grass, fats, coffee, blood and many others. The concentrated, gel consistency makes the product very effective, efficient and delicate in the impact on the fabric, so it can be used directly on stains. The product can be used for washing in automatic washing machines and for hand washing. It has a functional dispenser with protrusions, which helps in precise removal of stains during direct use. In the case of washing in an automatic washing machine, the dispenser helps to measure the right amount of gel to be placed in the washing machine drum. The product does not contain phosphates and chlorine, which affects its delicate impact on the fabric structure. The product formula has been developed taking into account environmental aspects in accordance with ISO 14001 and ISO 50001. Composition: 5-15% oxygen-based bleaching compounds, 5-15% anionic surfactants, 5-15% non-ionic surfactants, <5% phosphonates, <5% fragrance composition. In the case of difficult to remove or dried stains, add a scoop of 100ml stain remover. Then wash the fabric according to the manufacturer’s instructions. Add 100 ml of liquid to 5 liters of warm water (max. 40°C). For white fabrics, the maximum soaking time: 4 hours. After soaking, the fabric should be washed according to the manufacturer’s instructions and rinsed. Apply 20 ml stain remover directly to the stain. Leave for a maximum of 10 minutes. Rub the product into a stain with a dispenser, then rub the fabric according to the manufacturer’s instructions. Follow the instructions of the clothing manufacturer. Washed and soaked fabrics should not be dried directly at the source of heat and in the sun. Do not use if dry cleaning is recommended. Do not use on metal buttons and buckles. After applying the stain remover to the fabric, do not expose it to sunlight. Protect the product from drying on the fabric. Store in a vertical position in a cool place. Hazards: Causes serious eye damage. Irritating to skin. effective and at the same time gentle in action. stain remover for colored fabrics.